Side Cash Warnings Can Crowd Rising Really Fund Your Needs? Can Crowd Rising Really Fund Your Needs? Crowdfunding is a recent addition to the internet allowing businesses to get started and grow thanks to other people’s willingness to invest some cash in return for something. Kickstarter is probably the most well know crowdfunding site out there right now. 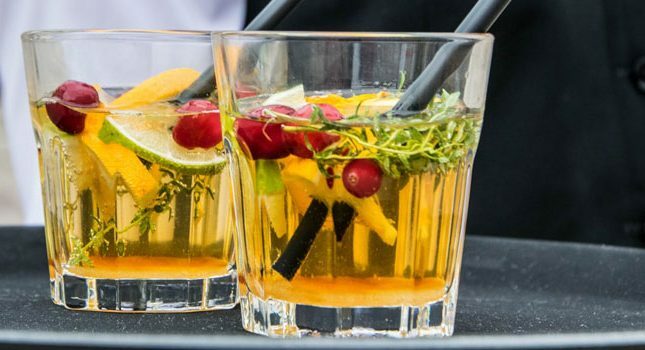 On the back of crowdfunding another type of service has evolved: crowdfunding for individuals. Often these are set up to help people pay for medical, funeral, school and other expenses that will help people out in difficult times. Of course, where there are legitimate businesses scammers and unethical people will thrive! One site that has recently caused me concern is Crowd Rising. What is Crowd Rising? Is it a Scam? Crowd Rising pitches itself as a “peer to peer direct funding” site and it’s sales page devotes a lot of time to telling you how a single donation of $20 can change someone’s life and makes several reference to the Bible. It also clearly states that there are no fees, “no scams and no gimmicks”. How does Crowd Rising work? The idea is simple, you pay an initial $20 bucks and from there you can earn a more money as people fund you. The problem that I see is that Crowd Rising is not a straight forward funding platform. Instead of searching and seeing someone’s plea and funding them, you enter into a complicated world reminiscent of Multi-Level Marketing. According to one of Crowd Rising’s videos once you’re brought into the system and paid your $20 you can then bring 5 people in below you. Your $20 goes to the person who brought you in, and the money that the people you referred to the system goes to you. To explain, you pay (and lose) $20, but if you bring in 5 other people you make $100. From there you can pay to upgrade, sorry to “step up” to use this systems parlance, to the next level. At that point if the 5 people below you refer more people you and if you’ve “stepped up” you can earn $40 per person, up to $1000. Crowdfunding and donations are not really this complicated! The chain continues with each step costing you more money but allowing you in theory to make more money. This doesn’t really sound like a donation system does it? Rather it sounds exactly like an MLM system. Not only that but there is no physical or digital product in return, which makes this system incredibly dubious and possibly an illegal ponzi scheme. The only way to make money is to continue to add new people to the system. This will eventually collapse as they are always unsustainable. While you can direct donations to the person above you, if that person isn’t on the right level, the donations skip up the chain until they reach someone on the right stage to accept the donation. As such while Crowd Rising states that this system is ideal for “Charities, Schools, Clubs, Churches, non-profits, family, and personal financial needs” it really isn’t as it’s not a direct donation system. In fact, because the system automates moving funds up the chain it’s quite possible for the people behind this system (ominously known as the 5 Horsemen) to manipulate where the funds eventually go or to add fake accounts. I’m not saying that’s the case, but it’s a possibility. Being sat at the top of the heap the Horsemen are well placed to receive a large amount of the gifting that occurs. The terms outlined on Crowd Rising are sparse but worrying. First off, the site states they are basically not liable for anything, especially if the service stops (which is very common in MLM schemes). Secondly, all payments are made direct between individuals with no oversight from the platform – they specifically state they do not use a payment processor themselves. 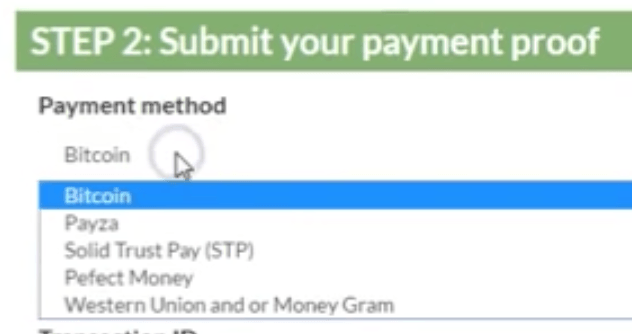 According to the videos, payments are made via certain processors such as Bitcoin, Payza, Solid Trust Pay, Perfect Money and Western Union/Money Gram. None of these are particularly well known (where’s PayPal for instance) and those that are often have issues with fraud (Western Union is rife with this due to their business model). Bitcoin as well is often viewed as a payment method preferred by less legitimate folks due to it’s increased privacy. My concern is that there are no well-known, highly trusted processors on this list. That plus the fact it’s up to you to resolve payments means you could be left high and dry with no backing from Crowd Rising if things do go wrong. Payza generally gets bad reviews, Solid Trust Pay seem legit but there’s plenty of user reviews online that suggest they aggressively ban accounts. Why would a crowd funding site have an earnings warning? Why are they discussing uplines? 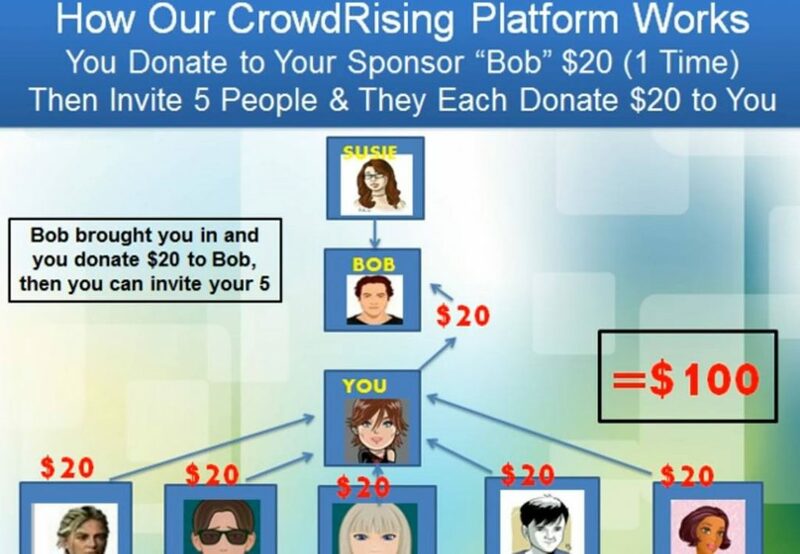 As stated, it’s because this system is not a crowdfunding or donation site, it’s Multi-Level Marketing. Lastly I want to touch again on the 5 Horsemen. This site has no information about who set it up or who controls it. They state in their FAQ that it’s not any form of business which is alarming. A quick WHOIS shows that a Canadian resident called Gerhard Rempel is the owner of the domain so it’s likely he also runs the site. If you’re looking to be charitable and to help those who are in need, find a different platform to do it on. In my opinion you should avoid Crowd Rising as it’s at best a poor implementation of crowdfunding and at worst illegal. There is no product for sale. You are just moving money around and continually need to add people to your matrix in order to get paid. This one will either collapse or be forcefully shut down by a government agency soon enough. This is always the case with schemes like these.